Home / QuiBidder of the Week – Alissa M.
Without first reading QuiBids 101, new QuiBidders are much less likely to get those sought-after deals that are happening daily on QuiBids.com. Like our newest QuiBidder of the Week – Alissa, and many others before her, she learned this the hard way. After losing a couple of auctions, she decided to learn some strategy to figure out how to win more. We think this was a good idea, because since then she has saved $250 on some truly great stuff. Continue reading to learn more about Alissa’s QuiBids experiences. 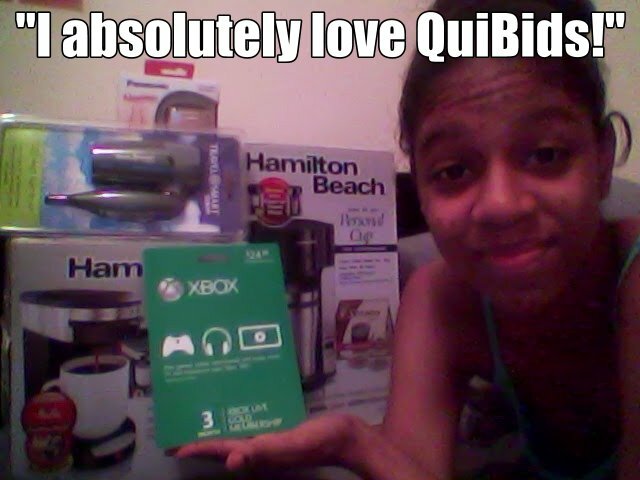 Click here to enter to become the next QuiBidder of the Week and win a $50 gift card of your choice (Must submit photo of you posing with your wins to be eligible). Thanks Alissa for sharing your story! She’ll receive a $50 gift card for submitting her photo and story on the blog today. Feel free to congratulate her in the comments below. Do you want to tell us your QuiBids story and become the next QuiBidder of the Week and win a $50 gift card of your choice? Then go here to submit your story and supplemental photo. Happy Bidding!